A trip to the spa is the ultimate way to de-stress, but we don't all have the time or money to head to the spa every month. So why not create your own calming sanctuary right at home that you can enjoy every single day? Here are a few simple tips for creating a spa bathroom retreat. Spas tend to use light colors for a calming effect, giving the space an organic feel. My Design Chic shows us that pale blue lends a soothing sense; head here for more pale blue inspiration. As shown in the second photo above, white is a great base color; then add accents of pale blue, beige and brown to keep the space from feeling too sterile. 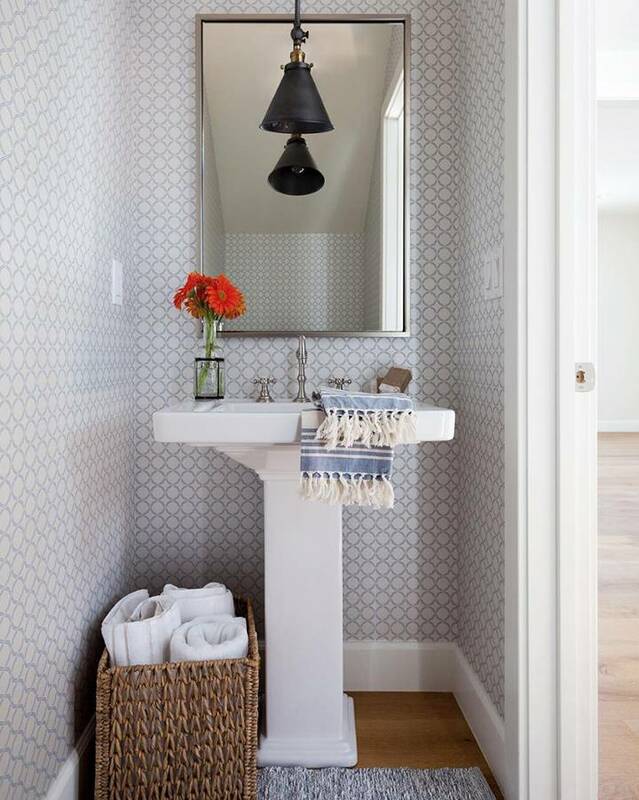 Check out Apartment Therapy for more tips on creating spa-like elegant bathroom decor. A cluster of houseplants give this room an inviting feel, while Martha Stewart's crabapple blossoms lend a romantic vibe. Place an orchid on your vanity for more of a zen look, as they've done over at Decor Pad. Scent plays a large role in mood, so don't forget to add relaxing aromas to your space. Hang eucalyptus over your shower head for a refreshing scent as recommended by Uphaa, or place reed diffusers on your countertop. Head over to Elizabeth Danon Interiors for more tips on adding organic scents to your home. Complete your candlelit bath with rose petals for a warm, romantic break. Check out the full DIY tutorial for this handy wooden bathtub tray over at Snippets of Design. It's the little things in life! And don't forget to add a glass of champagne as The Online Stylist has done. Eliminating labels will reduce visual clutter in the room... try transferring cotton balls and q-tips to apothecary jars as they've done over at Design Indulgences. A curved shower curtain will add space to your shower area for a more luxurious experience. Check out this and other easy spa bathroom refreshers over at Modern Furniture Design. Last, an easy way to make your bathroom feel spa-like is to roll up your towels as Timothy Whealon has done. Sure, your basic shower head from the 90's probably still functions just fine. But wouldn't a rain system be so much more luxurious? And a handheld attachment would be oh-so-handy when you come home from the park all muddy. They don't necessarily cost an arm and a leg either... Amazon has a wide range of options. Be sure to pick something that will fit with your existing plumbing and finishes. There's nothing more luxurious than a thick, soft towel to wrap up in after a long bath. Indulge in a set of high quality towels for those days when you're looking for that spa bathroom feel. Go for oversized, soft and absorbent... and be sure to look at the reviews online if you can't check them out in person. Don't forget to choose a set of stylish hand towels too - it's a decorative touch that will make your space feel like a relaxing personal bathroom retreat. Check out some of our favorite towels below. We listen to music in the office, in the car and elsewhere, so why not get some tunes going to help us relax in the shower as well? Music can have a wonderful mood-altering effect, so it's a must for getting ready in the morning. Here are the best waterproof bluetooth speakers according to Neckstar. Quite a few ring in at under $50, believe it or not!